SmartForexExpert is Partner of ICMarkets and Tickmill, two of our favorite ECN brokers.. If you want to move to these brokers or have already an account, you now have the opportunity to pay a discounted commission on both brokers. Visit SFE webpage, go to Brokers and follow the instructions. The Smartforexexpert EURUSD advisor, uses 7 different 'price action style' system on the EURUSD pair, on the M5, M15, M30, H1 timeframes. The EURUSD pair offers in general the best performance in the major part of the SFE EAs. In this EA, a selection of SFE systems has been rewritten and configured explicitly for get the best performance in the EURUSD pair. Please publish backtest result on comment section. The SFE Night Scalper with the CHF pairs, awesome performance. 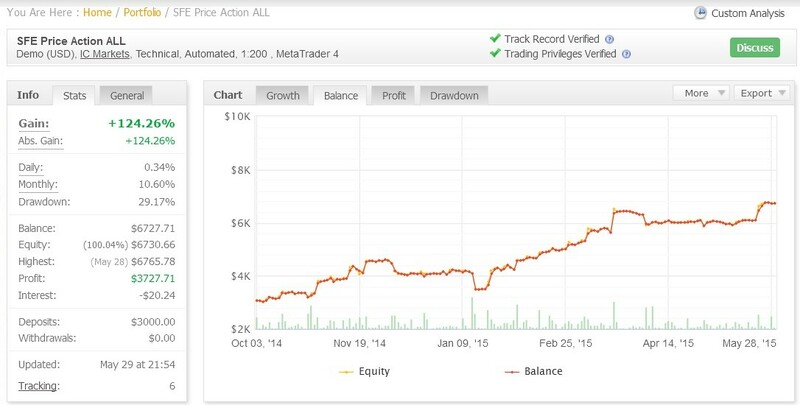 The SFE Night Scalper is reaching new highs, and keep the growth after more than two years. The last version has been published this week and comes with the 'singlechart' feature, which let's manage all the pairs from only one chart. The SFE Night Scalper is reaching new highs, and keep the growth after two years. The last version comes with nice improvements and is performing very good for the moment. KISS is an acronym for "Keep it simple, stupid" as a design principle that most systems work best if they are kept simple rather than made complicated. This expert is the result of simplifying at maximum level the algorithms of the others SFE 'price action' based experts, with the goal of approach more the expectation offered in the backtest with the performance in forward. The use of the expert is very simple, and needs very low computer resources. SFE Price Action EA continues with the sustained growth since his publication. Near to 3 years growing. New highs for the SFE Price Action EA. After more than 28 months from the publication of the expert, the system continue showing his great performance, achieving high yearly profits with a very low risk. New Highs for Price Action. And also new highs for Fire and Forget. And a new version is coming in few days! SFE Price Action has completed a good month of May and has broken the highs of March. El experto SFE Price Action es un asesor experto con una gran diversificación de las operaciones, diferentes sistemas trabajan en 15 pares y 4 periodos. Esto aumenta las posibilidades de un crecimiento sostenido y reduce la exposición a un solo par u operaciones individuales. El riesgo está muy controlado. Basado en reglas de acción de precio propias, no se utilizan hedge, martingala, grid o cualquier otro tipo de prácticas peligrosas, como no cerrar las operaciones fallidas.